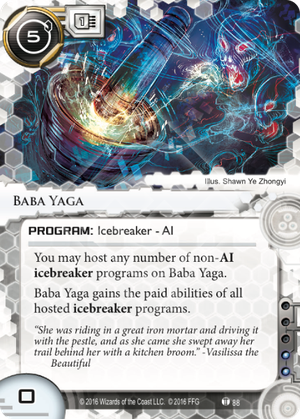 You may host any number of non-AI icebreaker programs on Baba Yaga. Baba Yaga gains the paid abilities of all hosted icebreaker programs. What is the main purpose of an AI breaker? You either use it instead of a full breaker suite (i.e. a Faust deck) or to complement a full breaker suite, handling weaknesses (i.e. Dai V in a stealth deck to counter mass sub ICE) or to apply early pressure while building up (i.e. Overmind in an Adam deck). First, setup speed. You need to either install Baba Yaga first and slap everything else on top of it afterwards. Or you need to Scavenge things on top of it afterwards. So, either you build your deck around clumsy reconstruction plany, or you have a massive tempo hit of installing a 5 AI breaker that doesn't do anything on it's own! There. I said it. Baba Yaga alone does not do a thing at all. Yes, it is highly abusable, but only late game, when you've finished constructing it. Second, safety. Usually, hosting your breaker suite onto anything should be avoided. Got all your main breakers on a single Daemon? Great, now the corp needs to land one single proram trash to wipe out your whole rig. Marcus Batty approves this. With Baba Yaga, you build a deck where your whole rig is planned around hosting all those breakers onto that one program. If you install Baba Yaga, host a freacter, a killer and a decoder onto it and then it get's trashed, you loose 4 programs at the same time and that is going to cost you the game. Third, an AI is an AI. Even if it uses abilities from non-AIs, it still can't break the good old AI-hate ICE like Turing and Swordsman and still triggers all the new AI-hate ICE like IP Block and Chiyashi. So, does Baba Yaga have the potential to be the most awesome, uber-efficient allround-breaker ever? Yes, but at a cost! So, now for the fun part... How exactly to we use Baba Yaga? What do we host on it to make it shine? We can host stuff that has great paid abilities, paired with pesky conditions we want to avoid. Some criminal breakers like Faerie, Mongoose, or the central breaker suite have text on it that keep it's awesome values in check. Baba Yaga does not copy this text. It gains "0: Break Sentry subroutine." from Faerie, but is not trashed on use. We can also host breakers that have a great strength and a great weakness. Most of the times, breakers come with two abilities: One pumps strength, the other breaks subs. But some breakers have a highly efficient ability for one thing and a mediocre for the other. Baba Yaga fixes that by combining these awesome abilities with other awesome abilities. Sharpshooter for example has maybe the best pumping ability of all breakers, but is trashed on use. So we slap it onto Baba Yaga, copy the pump ability and ignore the effect. Now we have an AI with that pumps +2 for 1! Slap this onto Anarch Core set breakers and you get a pretty efficient rig. Now, let's assume we have a Baba Yaga with 3 programs hosted onto it, what can it do? We can pump 2:+4 or 1:+1, so we're both flexible and efficient in pumping, and we can break Code Gates and Sentries for free. That's nuts. We can pump for the whole run or for single ICE and we can use Stealth creds to do it efficiently, while covering small strength gaps with normal creds using Corroder's pump ability. With only little stealth support, we can boost all the way we want. And breaking? Well, we have the standard "1: Break 1 subroutine." for all the three types. That's not bad. Pipeline? Pipeline?! Well, yes, why not? It is cheap, doesn't cost inf and provides a standard "1: Break 1 subroutine." ability we can slap onto our Baba Yaga that is pumped by Gordian Blade and Gordian Blade only. Plain and simple. There are many many more combos like this. (Even more if you are using more than just 3 breakers.) I'm excited to see which ones will get played. Baba Yaga is a really unique new take on an both AI breaker and big rigs at the same time. It has it's own limitations (like all AIs do), but can potentially be the most efficient breaker in the late game, if built accordingly. And it is a very customizable tool that looks different from deck to deck and maybe for some decks even from game to game. So, how does this work? Simple: Study Guide's 2 credit ability is used to place power counters on Baba Yaga (NOTE - When Baba Yaga uses the ability, it's Baba Yaga that gets the counter, not Study Guide). These power counters are then spent to use the breaking abilities of the three Cerberus heads. Next question: Why the hell would you do this??? After all, we're essentially assembling an overcomplicated way to spend 1 credit breaking every subroutine in the best case, which normal breakers can do without all the hoops already. That's where Nasir comes in: Traditionally, Nasir's ability is combined with Study Guide to spend credits on before his ID gets rid of them. This is good, but it only allows you to put those credits towards pumping a Decoder up. Rather narrow! With this new setup, you can instead put those credits towards the break cost of any ordinarily breakable ICE. A similar argument holds for recurring credits: if you weren't planning to use them in a run this turn anyway, they can be invested in breaking subroutines on later turns. It's important to note that you can use your Cerberus breakers independently since they ARE installed in order to be hosted on Baba Yaga. Combined with the usual methods of recycling these breakers, this can help keep your Baba Yaga power counters for when you really need them. Of course, this is in fact a terrible idea, but who cares? Finally, we can assemble the Cerberus AI we always knew should have existed! I really want to like this card. I am a Johnny and I really just want to brew. This card is built to appeal to people exactly like me. It's just so disappointing, though. It costs 5 and does nothing by itself. You have to cast this first. It has base zero strength and that really matters when it goes back to zero strength every ice by default. That 5 cost is huge in the first turn, making this card very slow. There is so much not to like about this card. It uses up 40% - 60% of your influence before you add your 4th card. It costs an MU. Literally everything is working against it. Still, it has so much promise. Look at it. You really want to be using something like Gordian Blade or Houdini with this, so you can pump one time for the run and that's it. You really want something like Faerie to break many sub sentries for 0. You still need something that can break barrier subs for 1 after both of those. There probably isn't a better card to use The Personal Touch on, so you might as well use that if you are in Shaper. If you can get a Sharpshooter out, at least you might be able to prevent something from trashing this unexpectedly while still getting cheap pumps. Ultimately, this is likely to end up as Johnny's Bane. One of those cards you spend 25 hours building a deck around and it all just turns out disappointing no matter what you do. No matter how much you try to make it work. That will be me. This card is meant to be a buildable, all-powerful monstrosity. The problem? It’s slow, you need the right cards in the right order, and it put you behind while not doing anything when there is nothing on it. And it uses MU. But… what if you don’t try to make it an all-powerful monstrosity? Sure, it’s great to combine the pumping ability of a Sharpshooter with the breaking ability of a Yog.0, but remember: for the same cost you could play Study Guide with 5 tokens. Which needs only one click and one card to install. And is better against Tollbooth and as good against Fairchild 3.0. And can break Turing on a remote. And only uses 1 MU. And… well, you get it. The point is: with one icebreaker on it, it’s pointless. With two icebreakers, it’s generally inefficient. And even with a full rig, it’s not always that useful: sure, with a Gordian Blade or the like, you only needs to pump once. But you also have a base strength of 0. Which means it isn’t really effective against servers with less than 3 ICEs. But there is one notable exception: Baba Yaga allows you to get the very powerful combination of the pumping ability of Faerie with the breaking ability of Faerie. Without the drawback of Faerie. You need to install 2 programs for a total install cost of 5, and 2 MU. That’s only 1 more than Mimic + Datasucker. It passes Komainu for 1, Rototurret for free, Tour Guide for free, Ichi 1.0 for 4, Archer for 6, Architect for 3… All that’s either awesome or decent. I may not be a groundbreaking combo, but it’s a good combination of two cards. Beside that, what are the costs and benefits of Baba Yaga + Faerie compared to Mimic + Datasucker? Well, for it to work, you need to install Baba Yaga first, and Faerie second. Except… Faerie is a good card by itself. You can install it, use it to pressure the corp early, and only then install Baba Yaga and recure your magical killer on it. It’s also an IA. Which means it hates stuff like Chiyashi or Swordsman. But you can mitigate the cost of Swordsman by using your Faerie and thus keep your big IA. You also cry if the corp can trash your daemon. And you probably need both Faerie and a way to get it back from the heap, which means it would cost you more influence than Mimic + Datasucker whatever your faction. Now, for the pro: contrary to Datasucker, it’s not a virus, which means it laugh at Macrophage. But, more important: you can choose to either not play it, or play it more. If you don’t expect to encounter sentries that often, don’t install Baba Yaga at all and manage with your Faerie (and maybe Sharpshooter, Deus X or whatever). If you are facing a glacier and need to pass multiple big ICEs, then (and only then) find a way to put your decoder and fracter on Baba Yaga. Maybe even a Sharpshooter. And manage to find a way to make it interesting, without depending on it. The goal is to have a good rig, that also synergize on Baba Yaga. Is it possible to make a deck that works both with and without Baba Yaga, and decides to play it or not depending on the corp? I don’t know. But if you’re already playing Faerie and sometime wished you had a way to make it permanent, you should give it a try. Although, to be honest, the best way to play Baba Yaga is with Monolith. By the time you pull your rig all together, the corp had the time to win, forfeit all their agendas, win again and lose by outdraw. But once it’s on, oh boy they’re screwed. This seems very abusable. Imagine running Baba Yaga in Smoke. Host Yog and Switchblade. No wonder most of the ice is now coming out with AI hate.